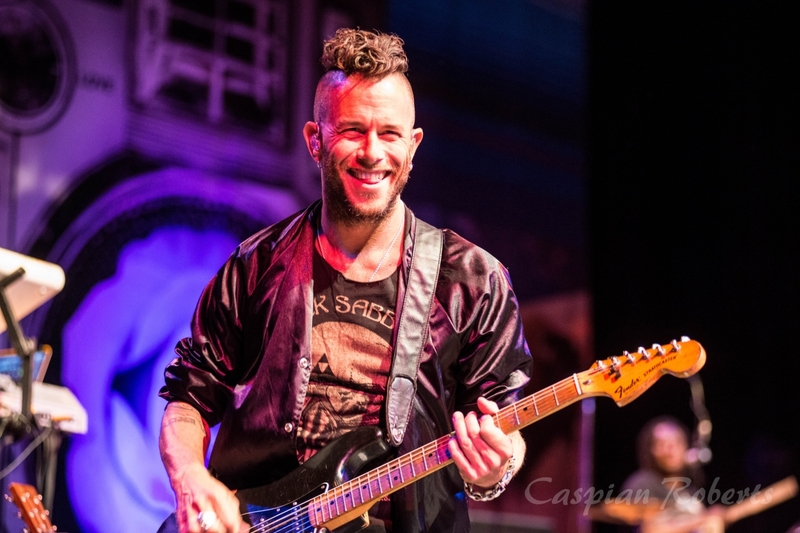 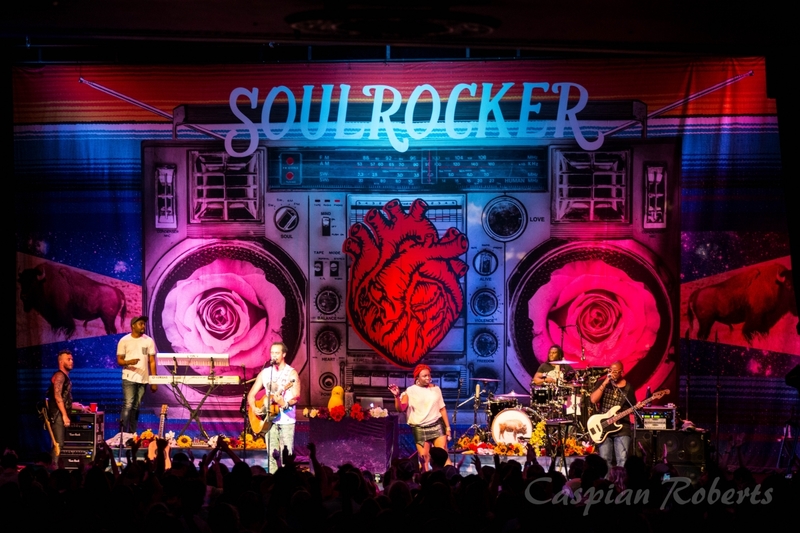 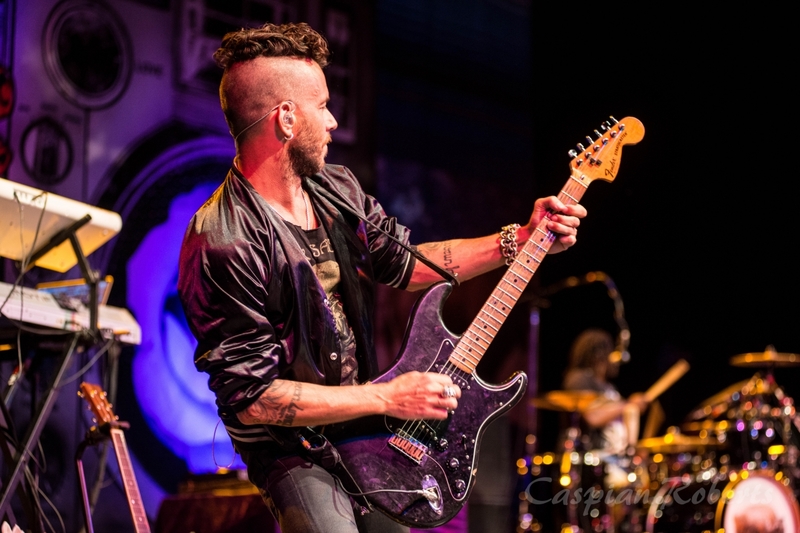 If you need something to lift you up from the disheartening troubles that seem to be plaguing our world right now, Michael Franti & Spearhead has the perfect cure: witness the Soul Rocker Tour, which just made a stop at the gorgeous Saenger Theatre in Mobile, AL. 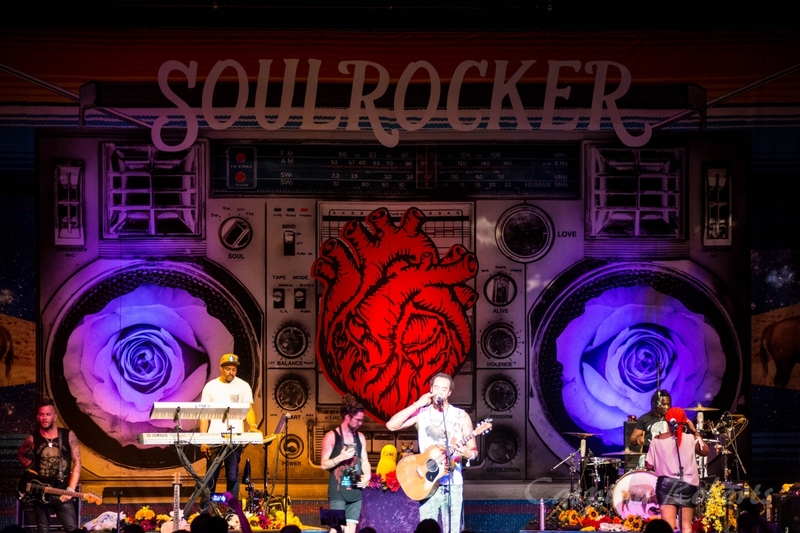 It was a Wednesday night, which may have explained why the show wasn’t totally sold out, but there was a strong contingency of music-loving, positive-minded folks that gathered to share the love with each other. 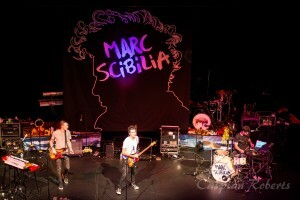 Opening act Marc Scibilia was a three-piece rock band with pleasant vocals and pleasing vibes, who eventually coaxed the crowd onto their feet to dance. 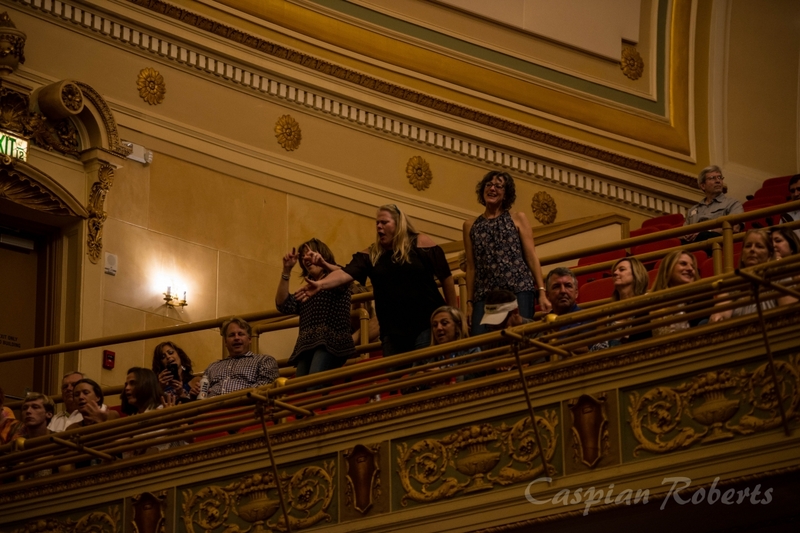 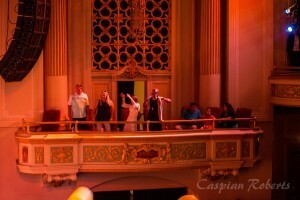 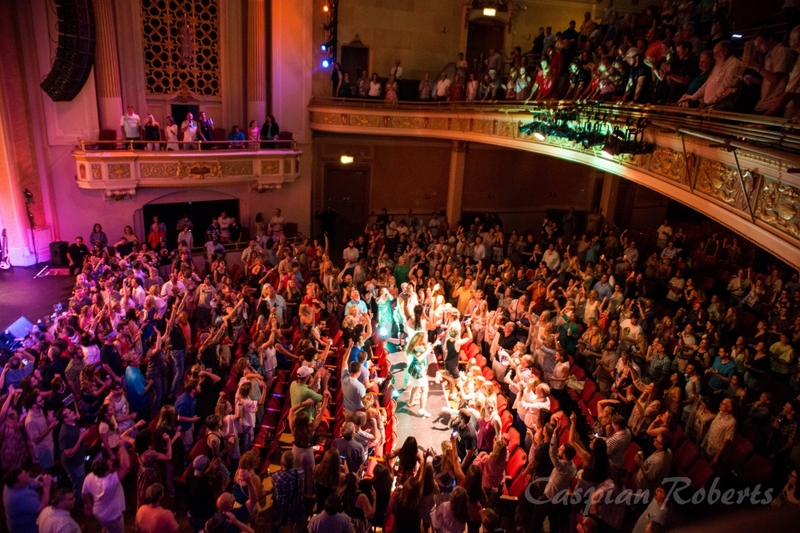 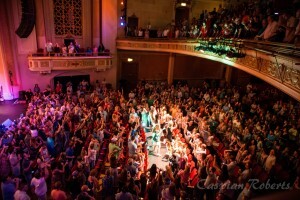 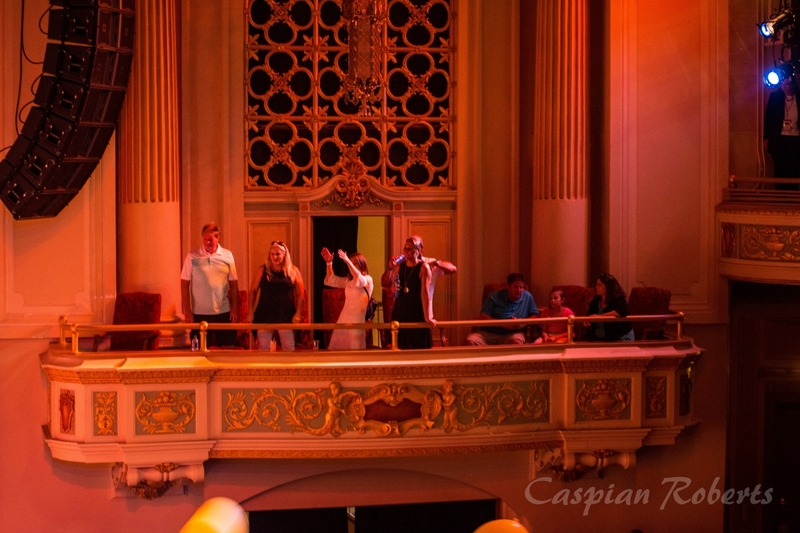 If you’ve attended concerts at the Saenger, you know this can be quite a feat indeed; then again, anyone going to a Spearhead show should fully expect to dance the night away, regardless of the presence of theatre seating! 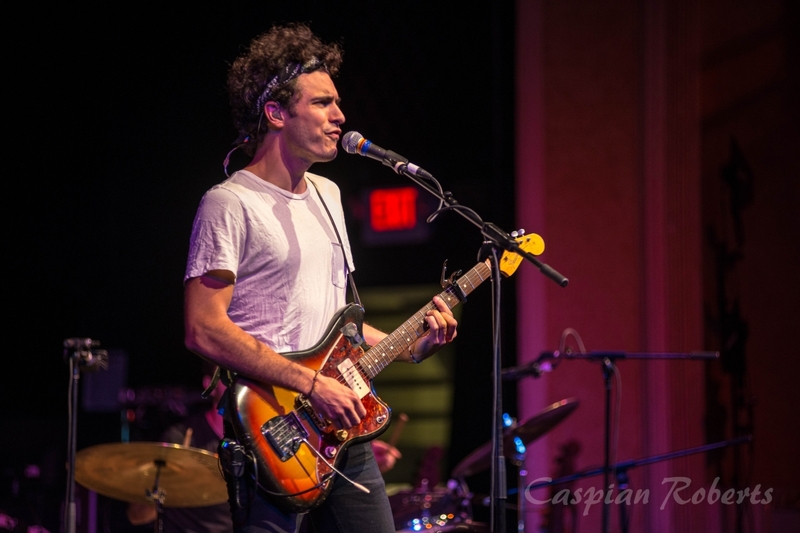 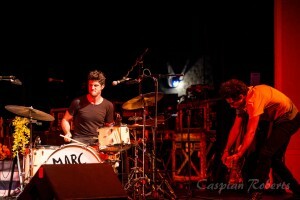 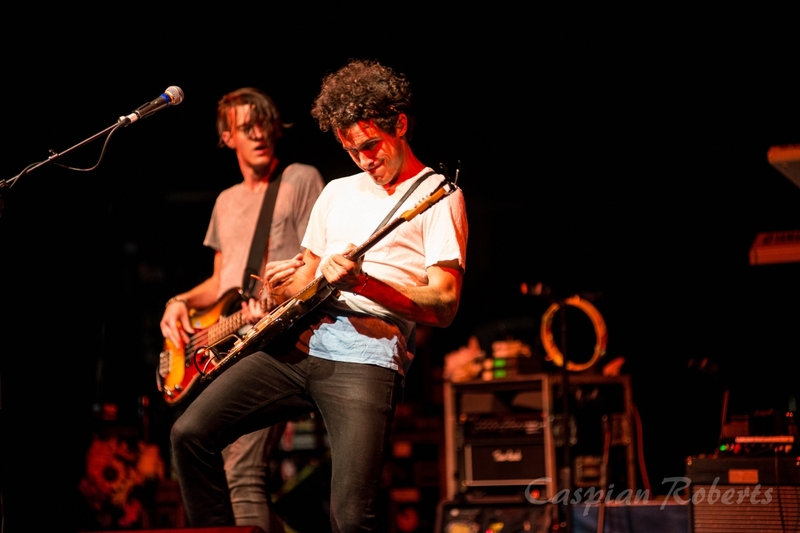 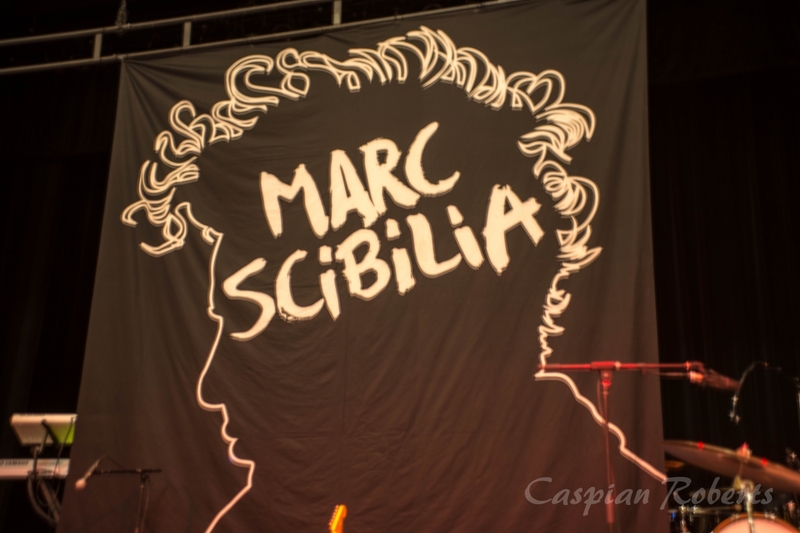 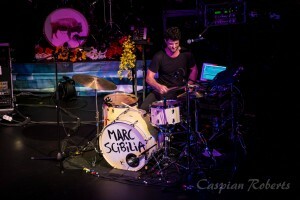 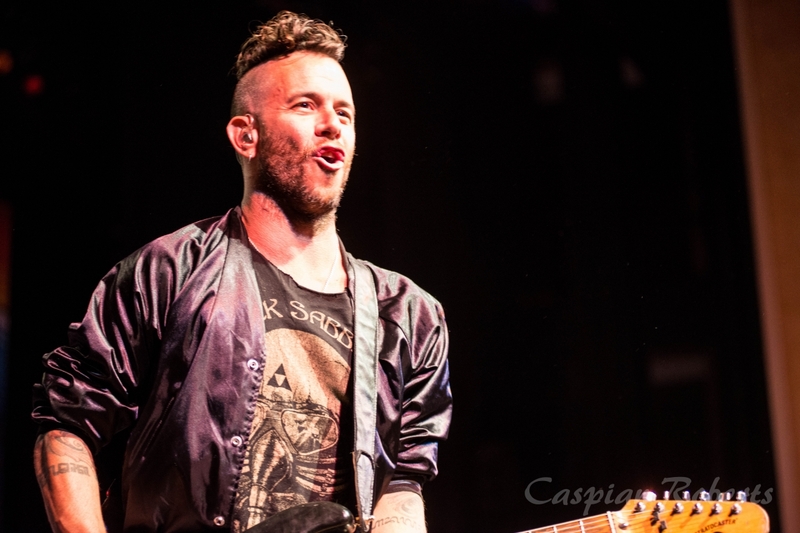 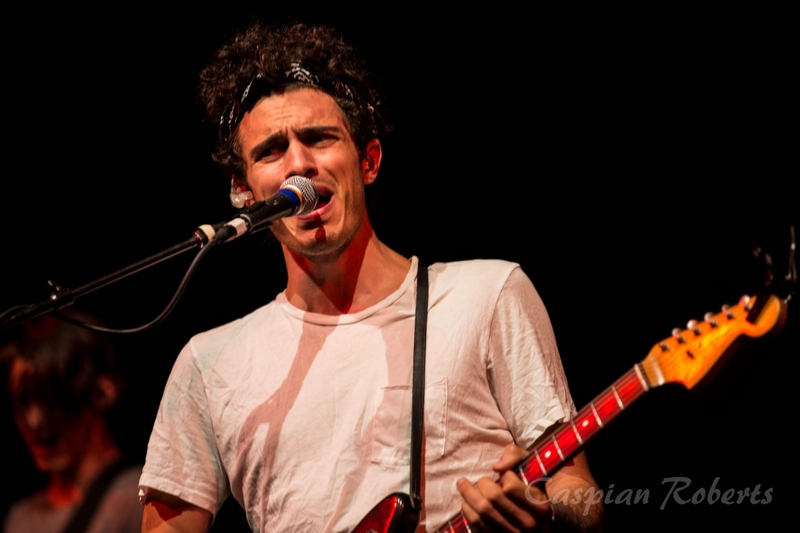 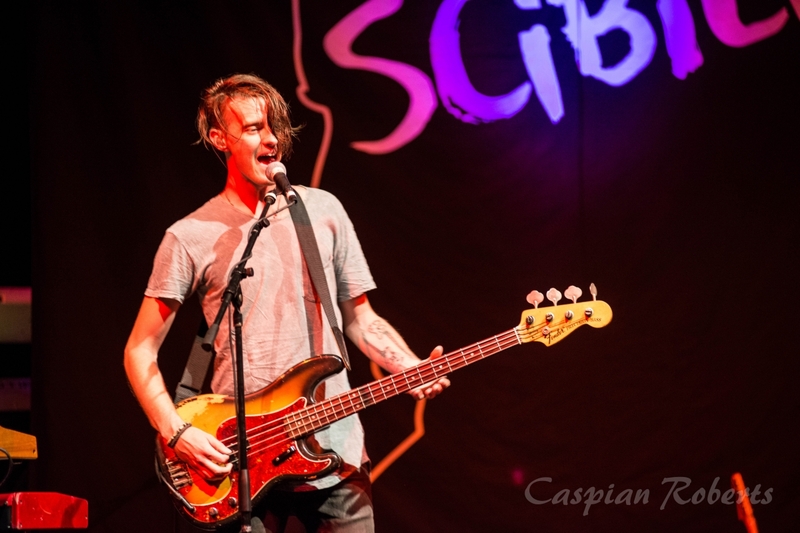 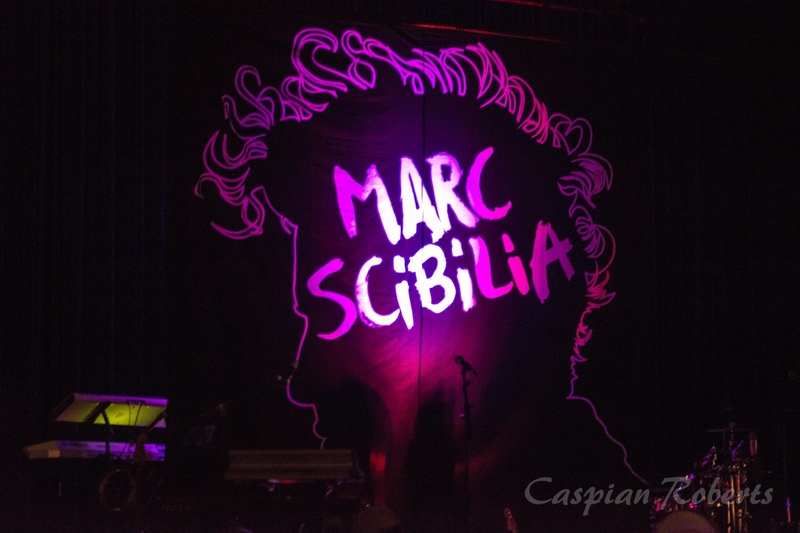 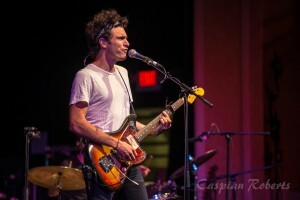 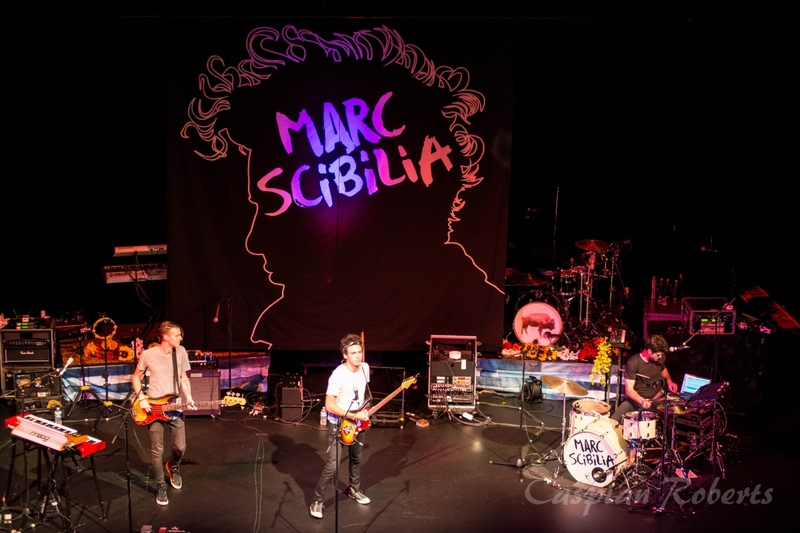 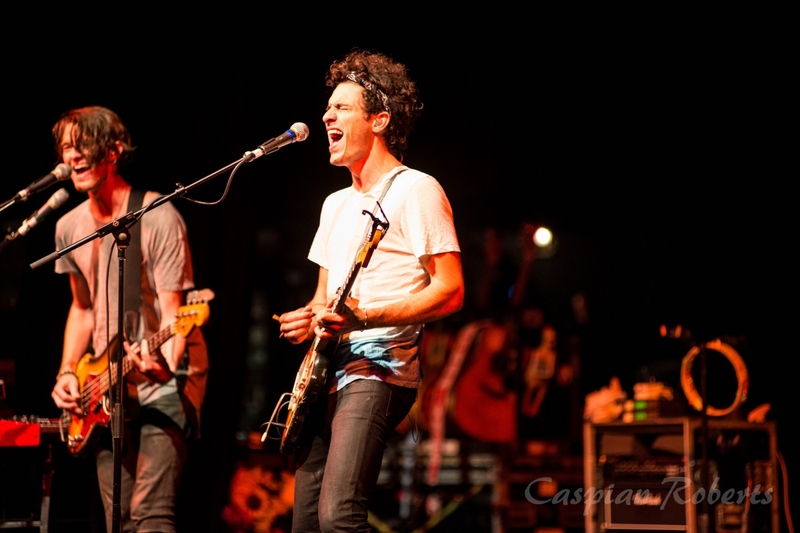 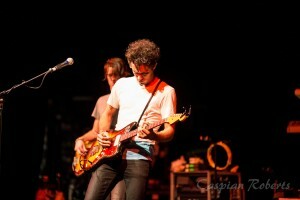 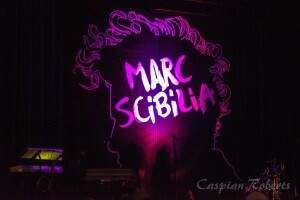 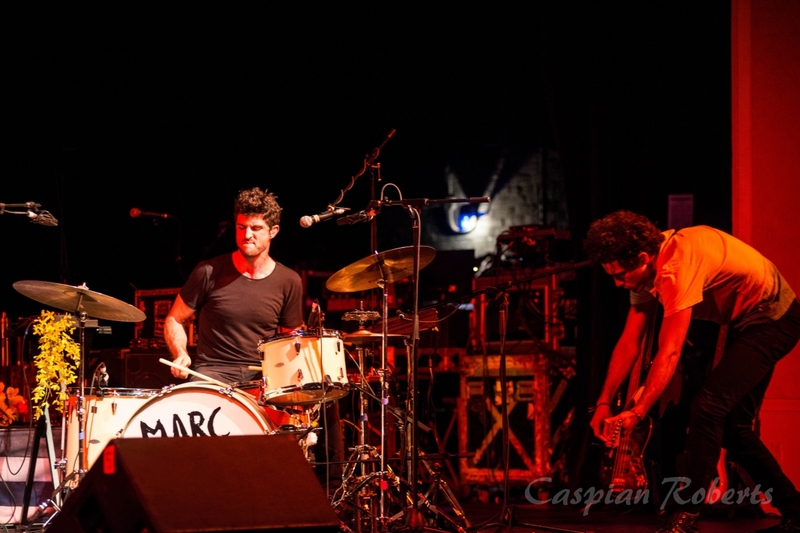 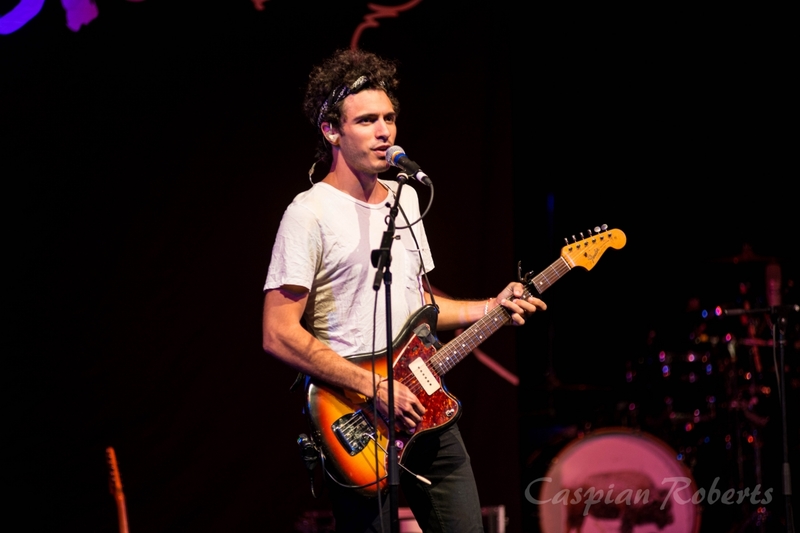 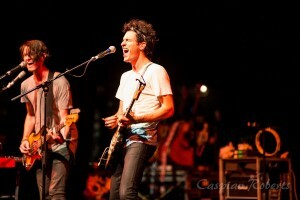 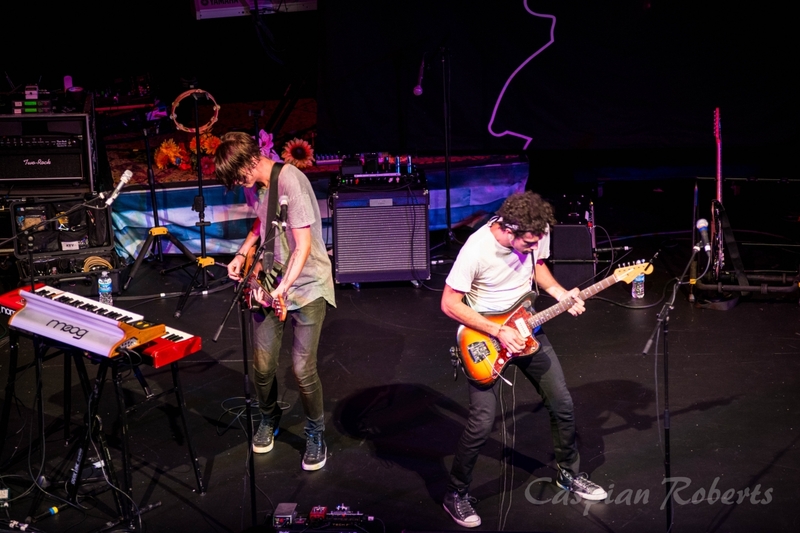 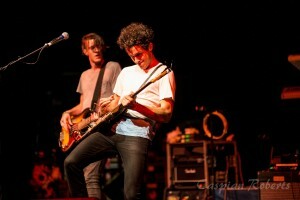 The audience was receptive and welcoming towards Marc Scibilia, who explained it was their first time in the Port City, and the band won the crowd over with a melodic “Jericho”, an upbeat “Better Man”, and a rousing cover of Bruce Springsteen’s “Dancing In the Dark”. 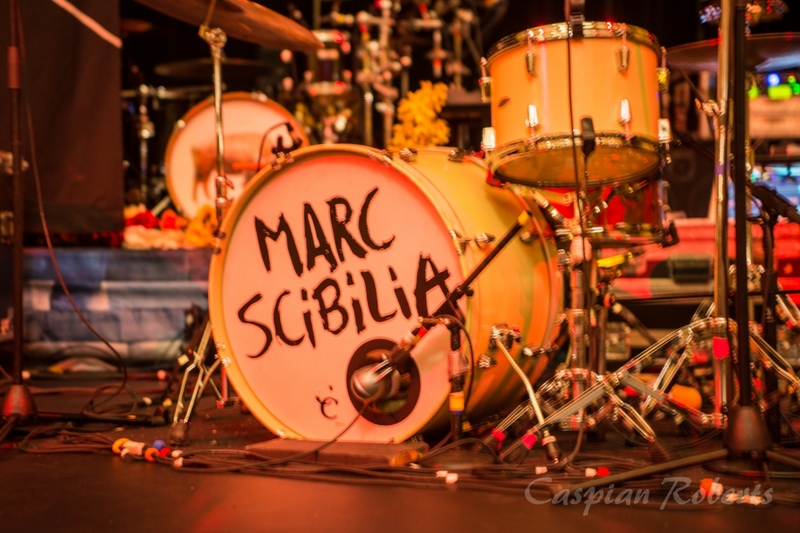 By the end of their set, the room was primed for delight. 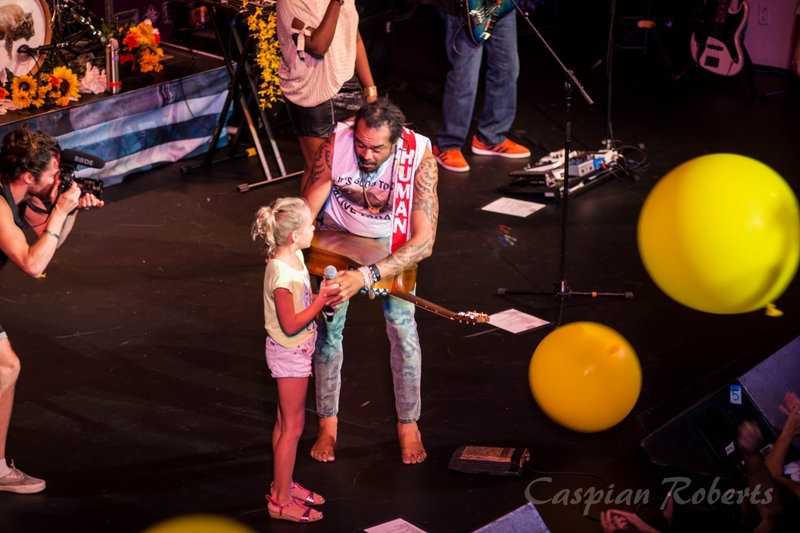 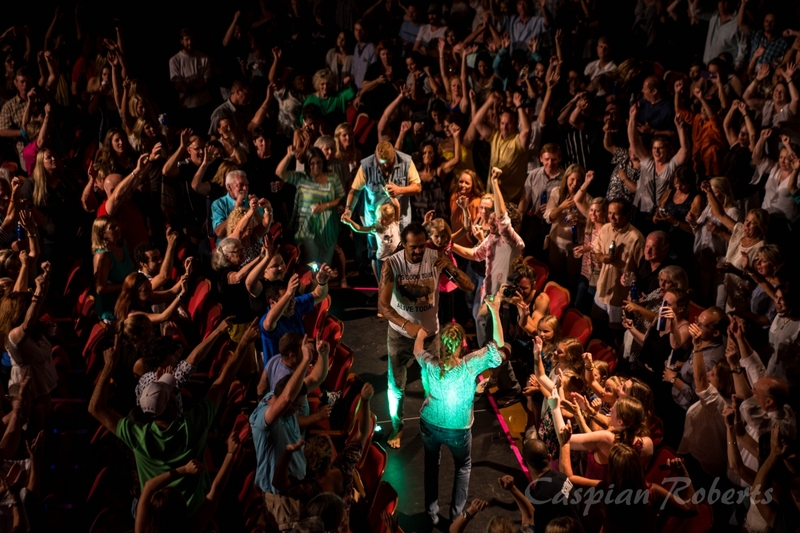 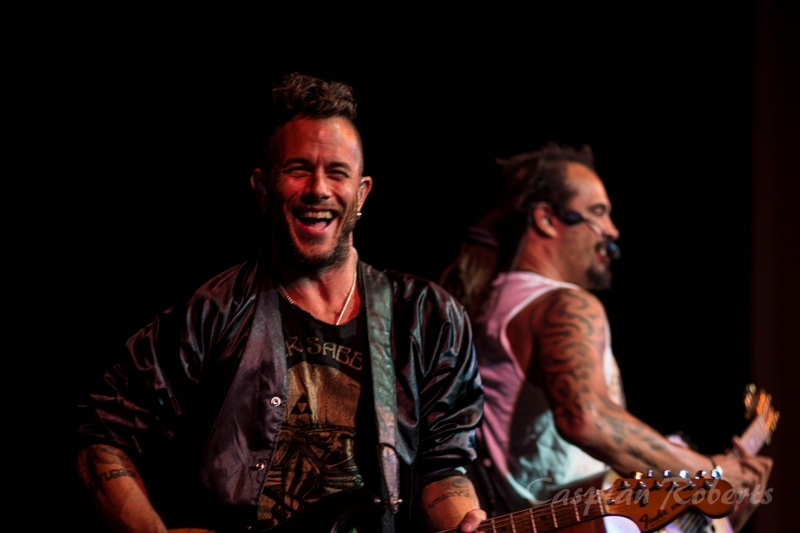 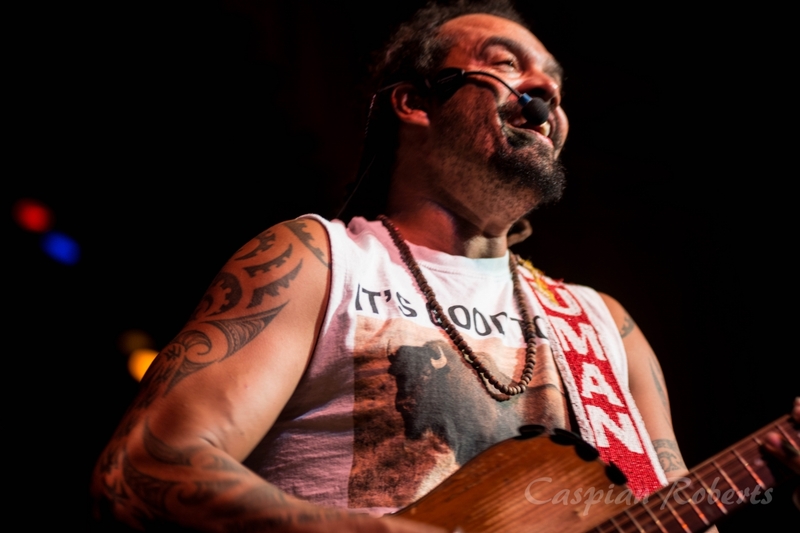 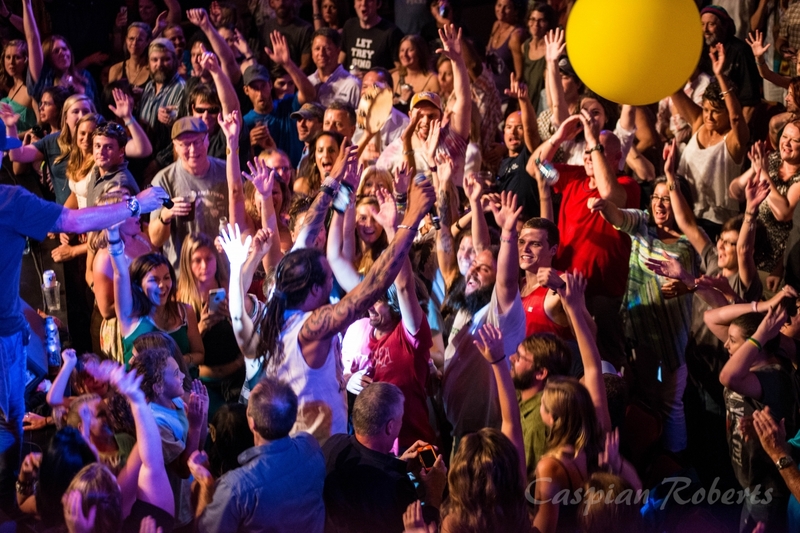 As soon as Michael Franti & Spearhead arrived onstage, a collective smile spread throughout the theatre, and the feeling was akin to receiving a 2-hour hug from humanity. This band is the epitome of Peace, Love, and Joy wrapped up in infinitely danceable feel-good music. 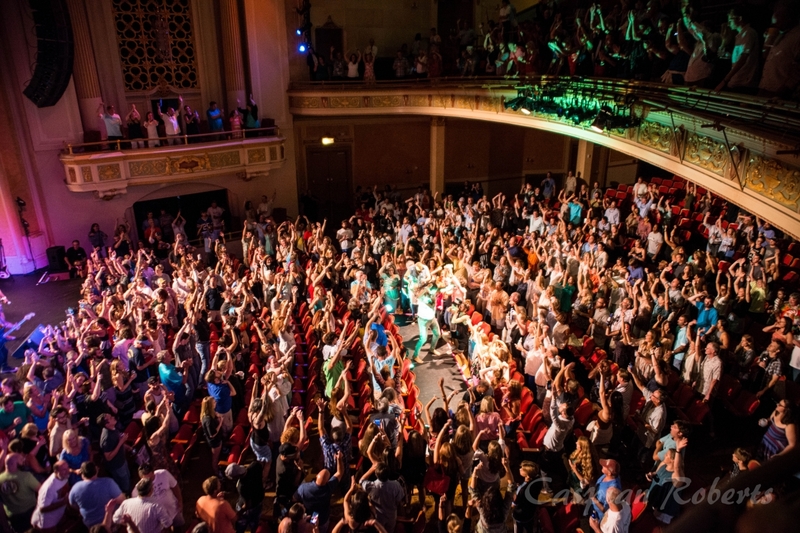 From the beginning of “Hey Hey Hey”, Michael enticed the crowd to raise their hands, jump, and dance for joy. 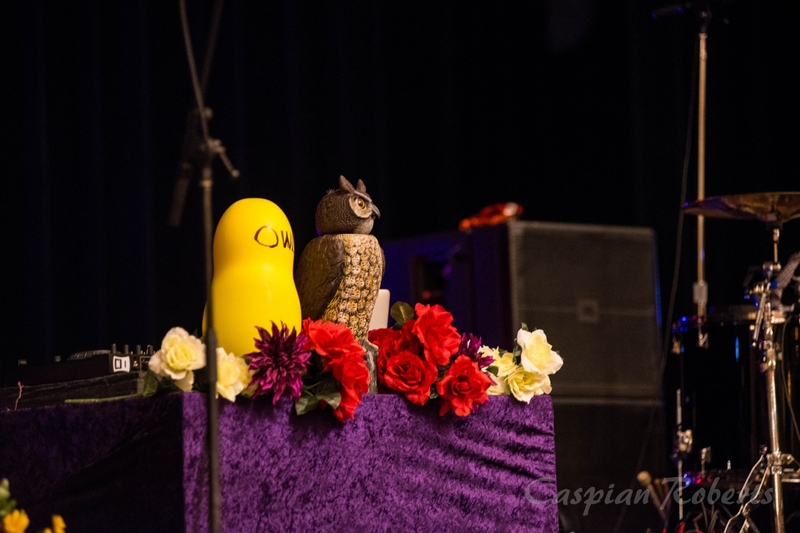 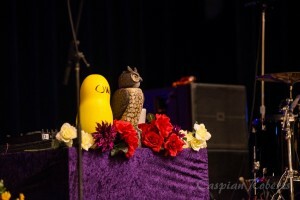 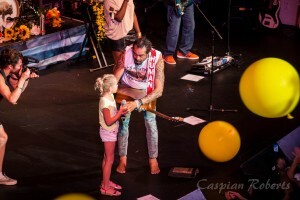 For “Sound of Sunshine” the band released dozens of massive yellow balloons into the crowd which bounced around jubilantly, and a young girl was invited onstage to help sing the refrain. 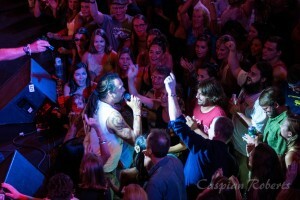 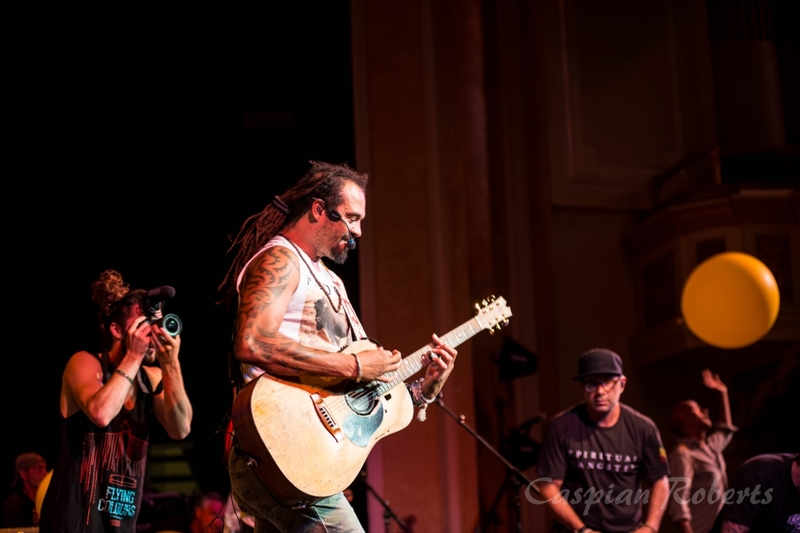 It is wonderful how Franti performs, constantly moving around amongst the crowd, intimately involving them in the concert. 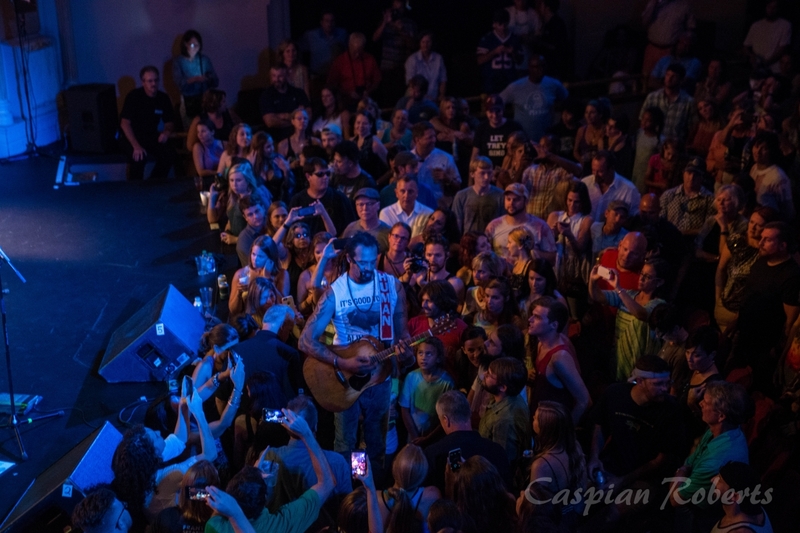 He played several songs from a small platform in the center of the room, bringing kids and adults with him to dance and sing. 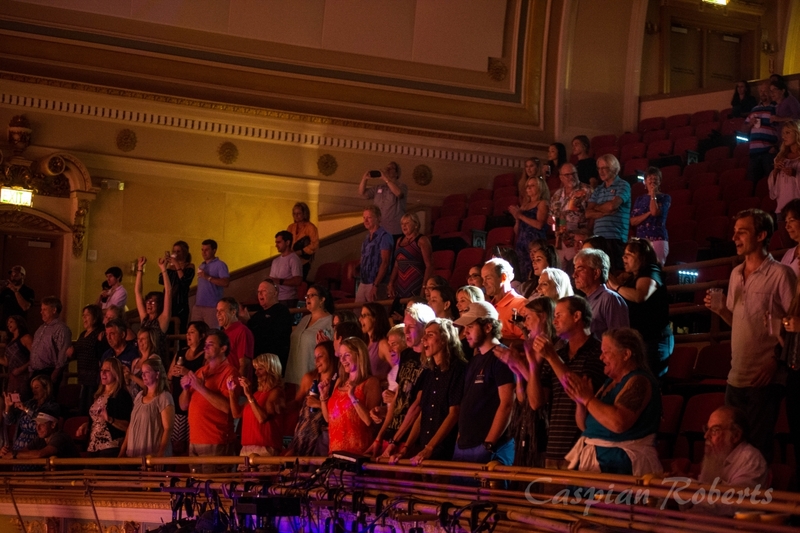 He even made his way to the beautiful balcony for the awesome new song “Summertime Is In Our Hands”. 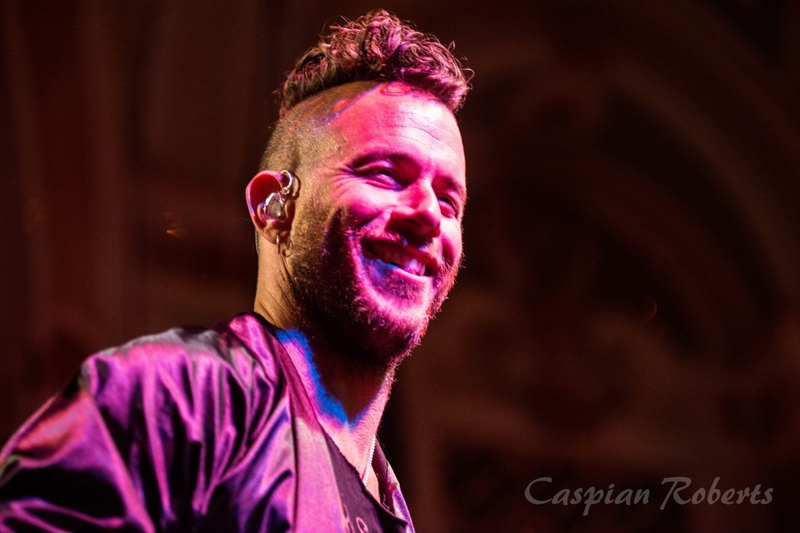 It is so uplifting to hear these musicians filling the world with a message of hope and positivity. 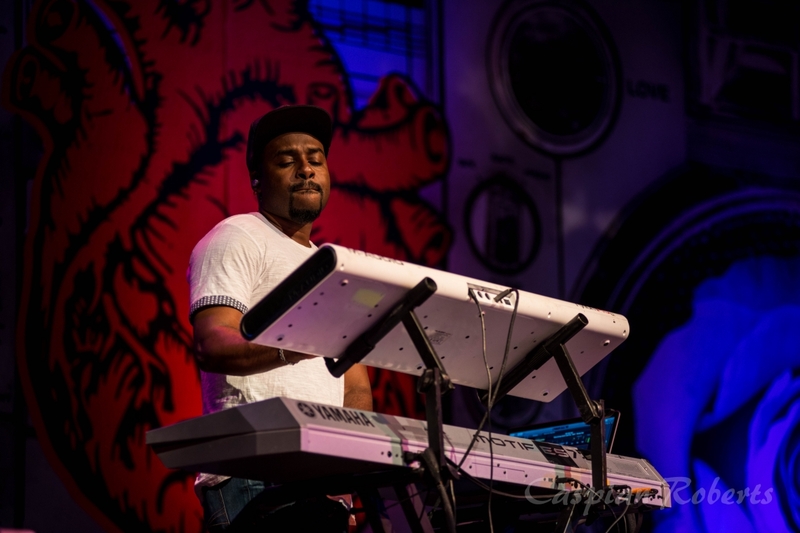 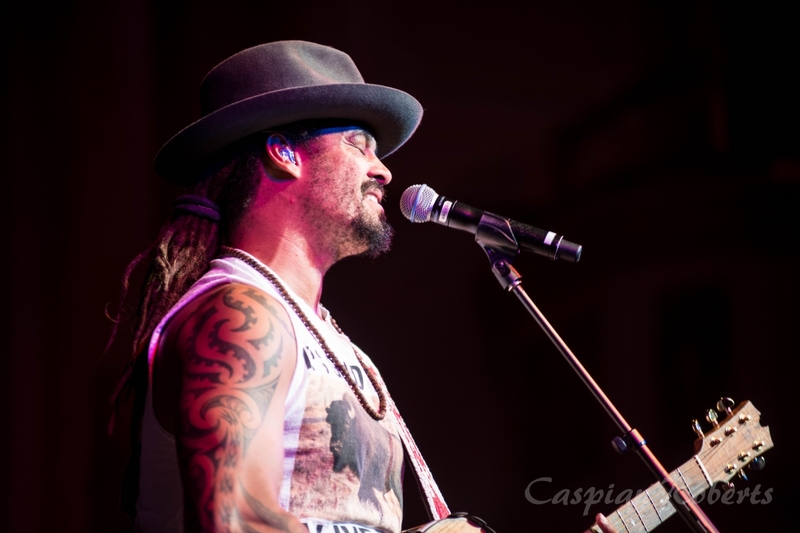 Franti shared the story of how a woman named Hope contacted him with a request that her husband Steve, who was suffering from advanced stage ALS, get to attend a concert. 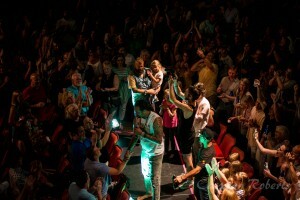 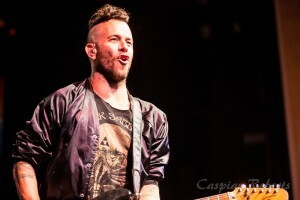 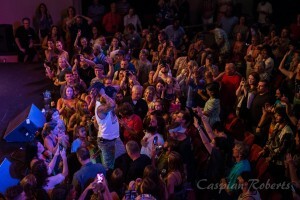 Not only did the band make Steve’s wish come true, but Michael and his wife Sara created Do It For The Love (www.doitforthelove.org) which grants concert-going wishes to people with life-threatening illnesses, children with severe challenges, and wounded veterans. Franti and Spearhead are also striving to remind us that, as Michael stated during the show, “Violence is the enemy, not each other!” Songs like “We Are All Earthlings” and “Good To Be Alive Today” really drove that message home, and allowed us to dance together and feel the Oneness that human beings are surely destined to achieve if we can set aside our differences and come together. 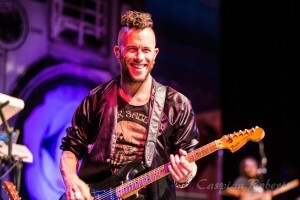 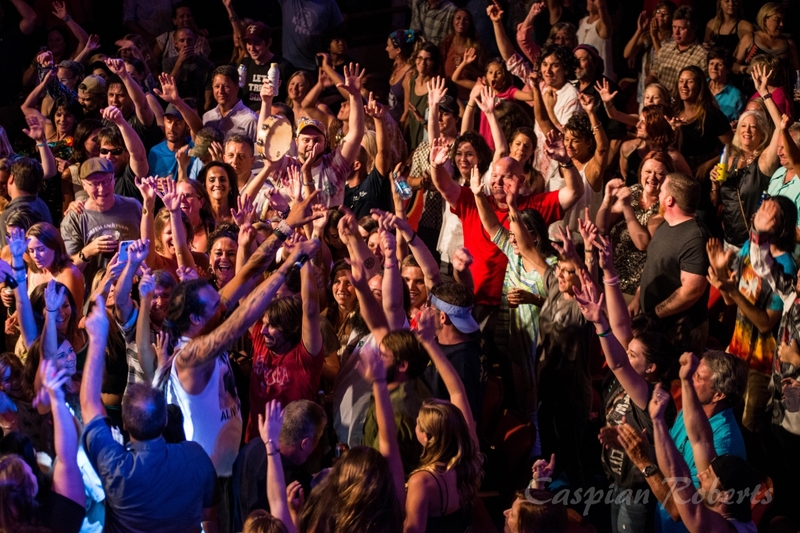 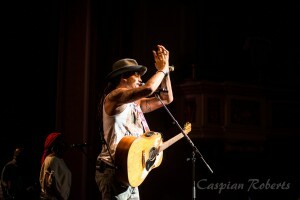 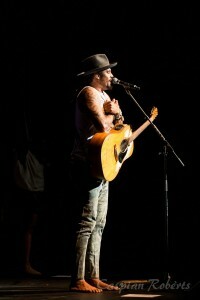 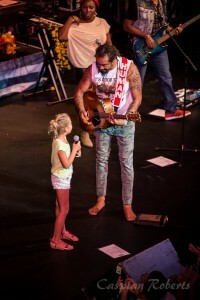 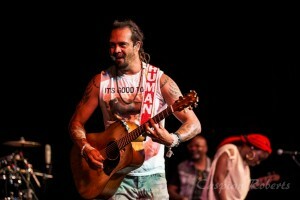 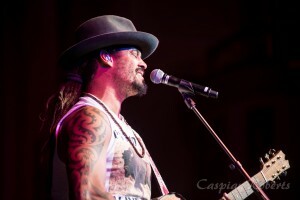 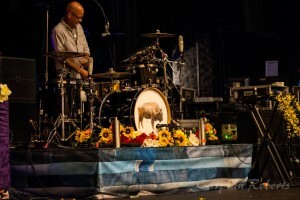 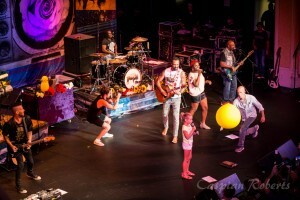 At the end of the show, Franti asked the audience to join hands or link arms with each other, and John Lennon’s “Imagine” was played over the speakers as everyone swayed in unity. 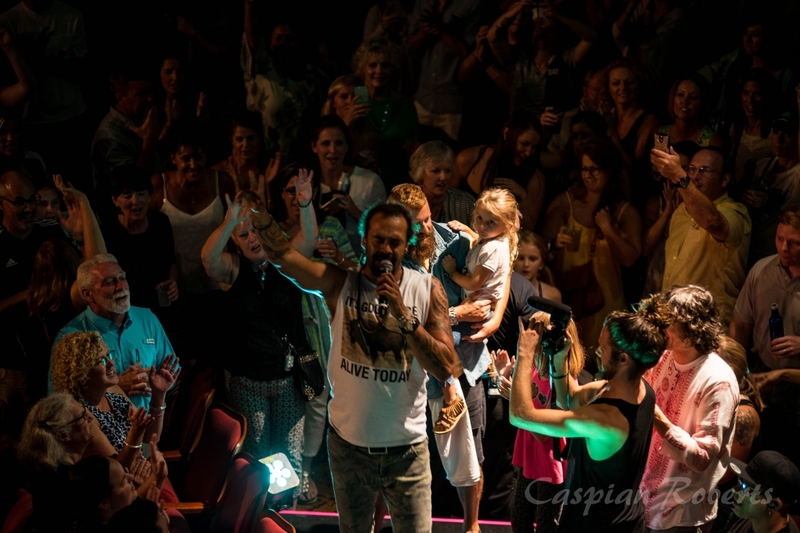 What a beautiful sentiment to close with! 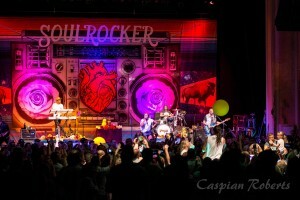 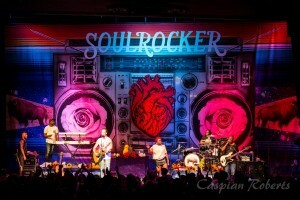 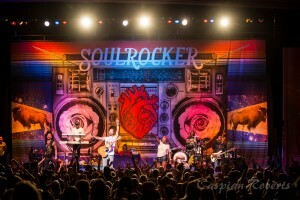 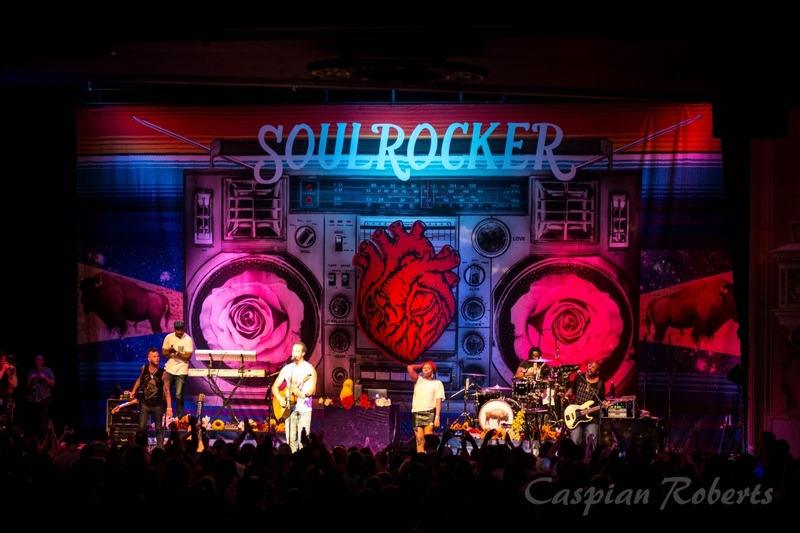 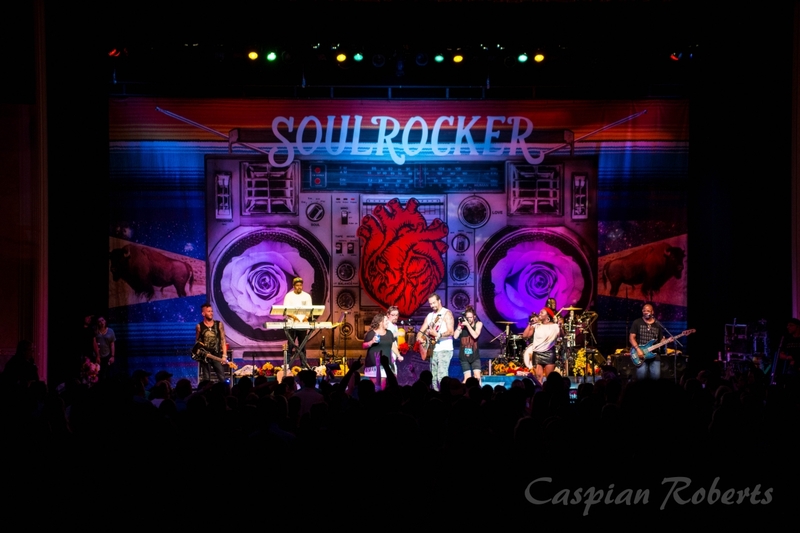 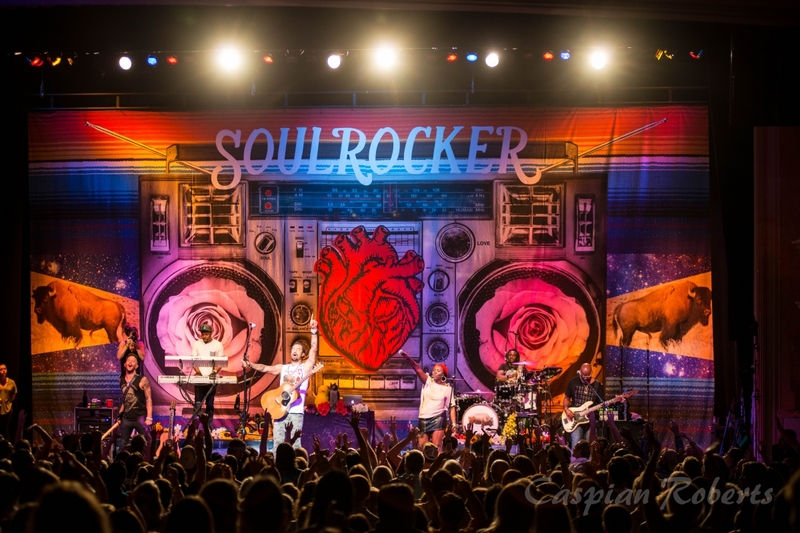 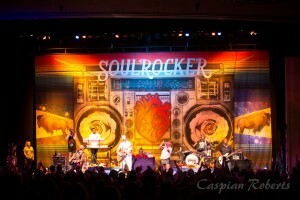 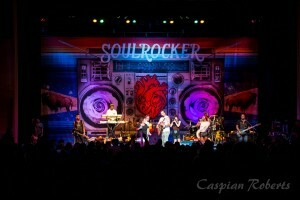 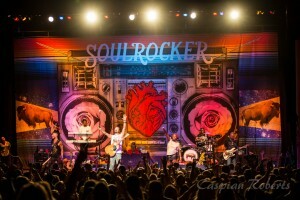 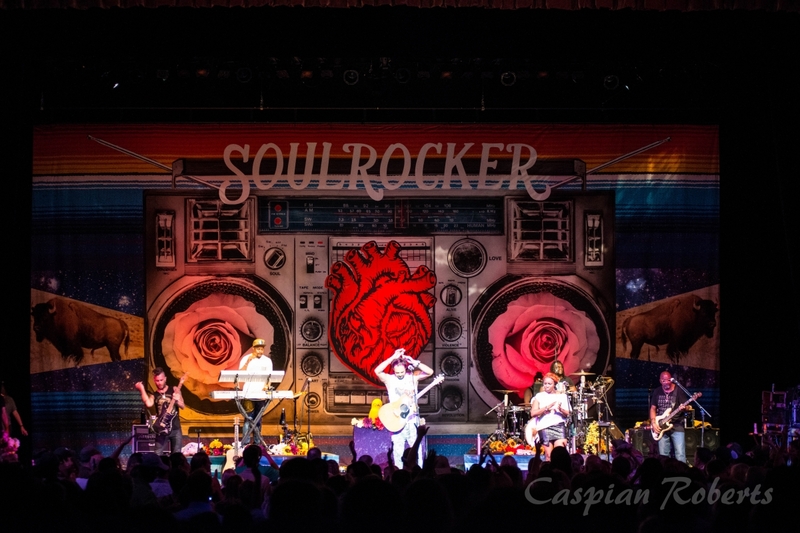 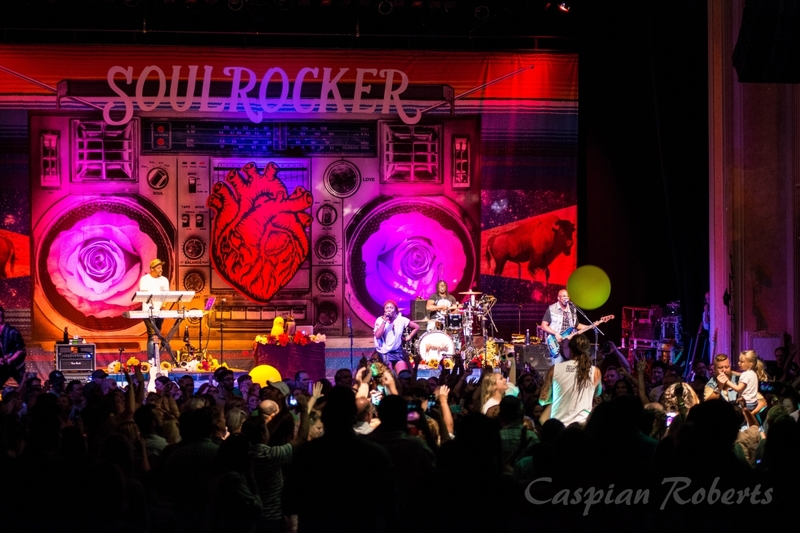 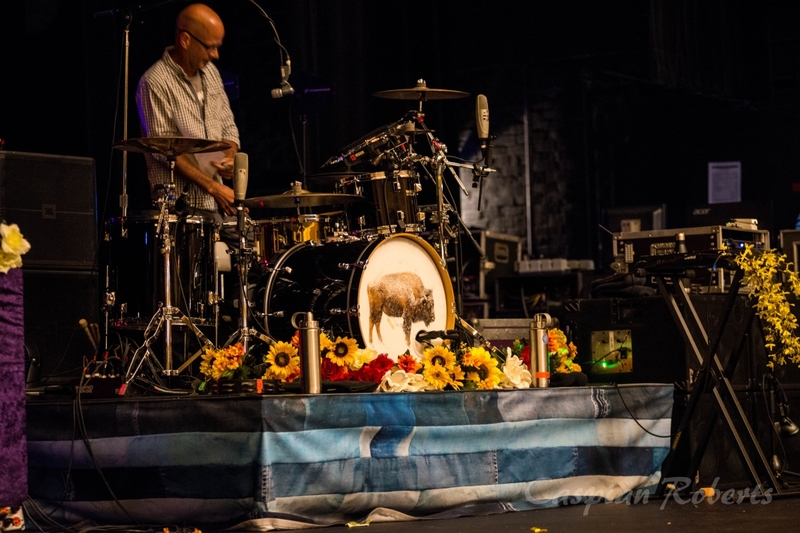 If you’re in need of a dose of hope and love, the Soul Rocker Tour has just what you need, and there are still a number of dates remaining for the western USA in August. 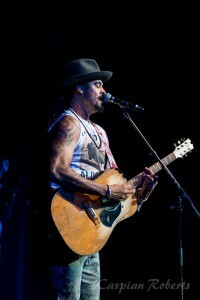 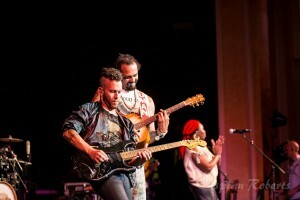 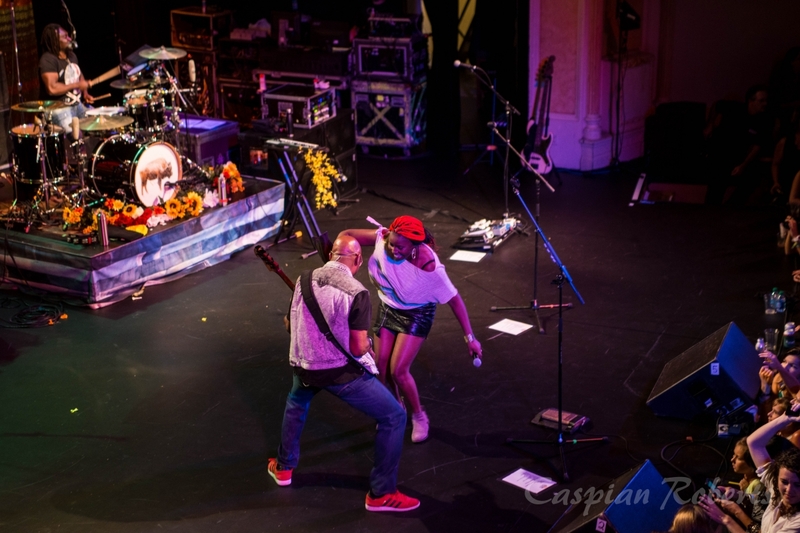 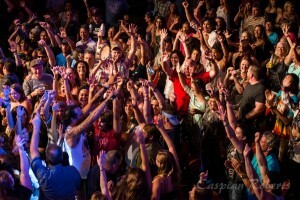 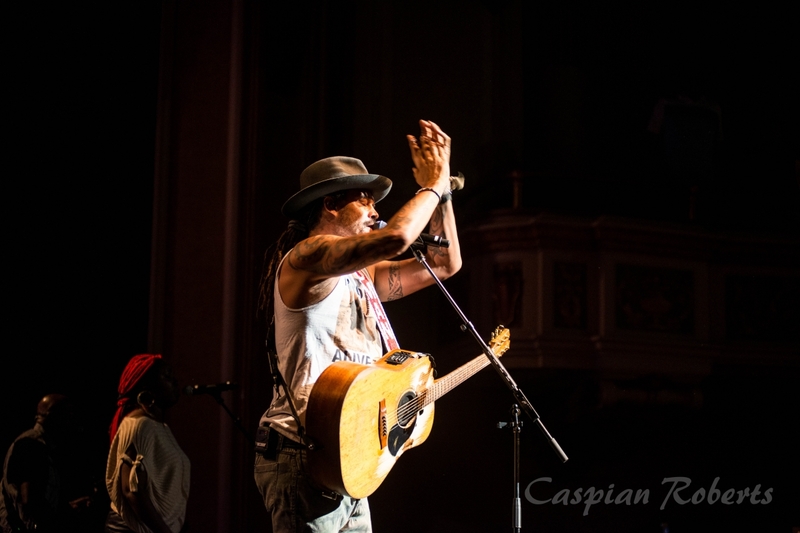 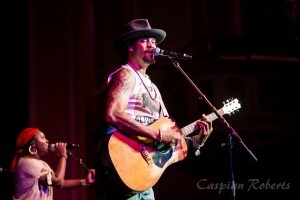 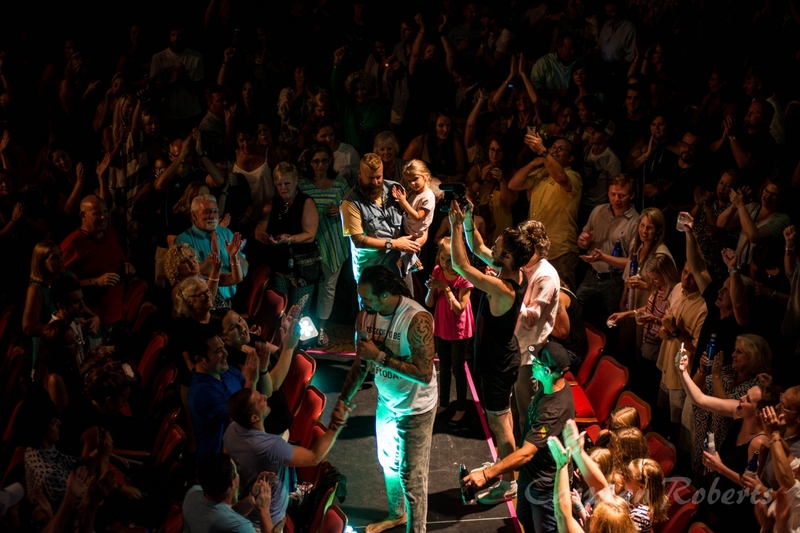 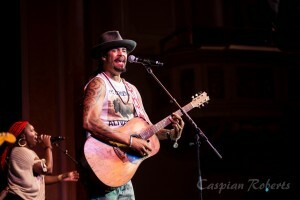 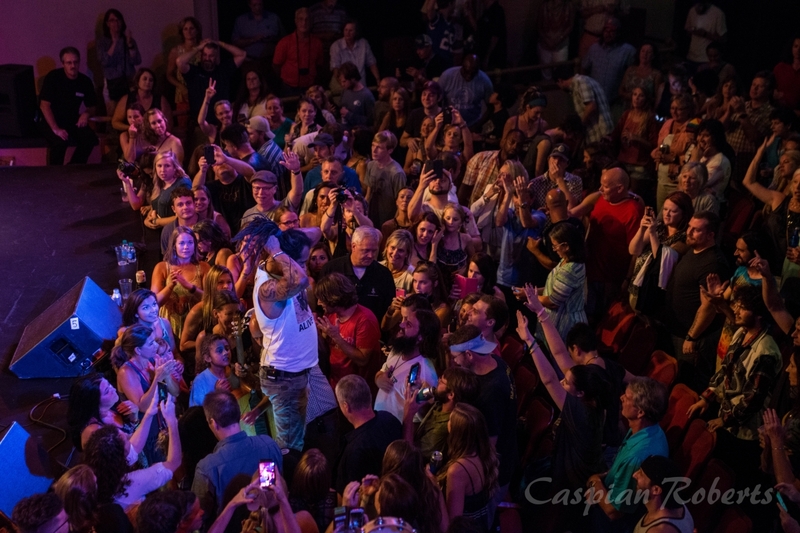 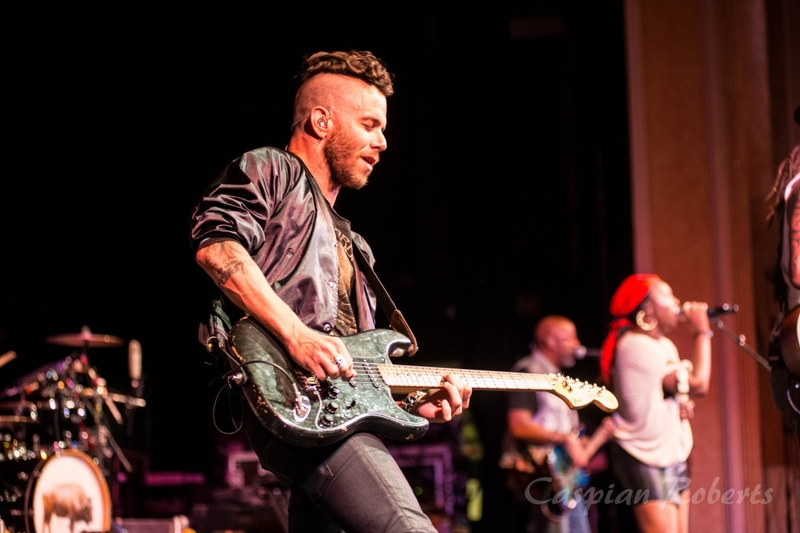 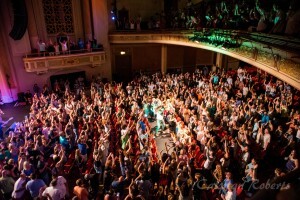 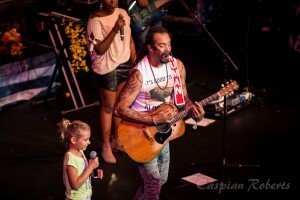 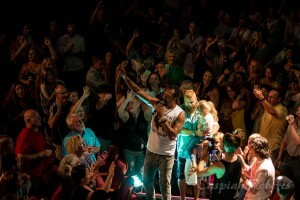 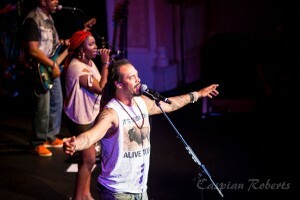 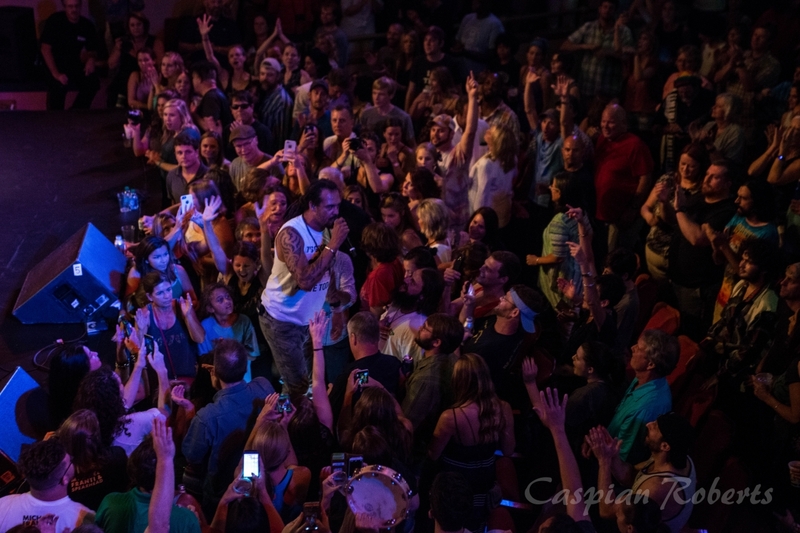 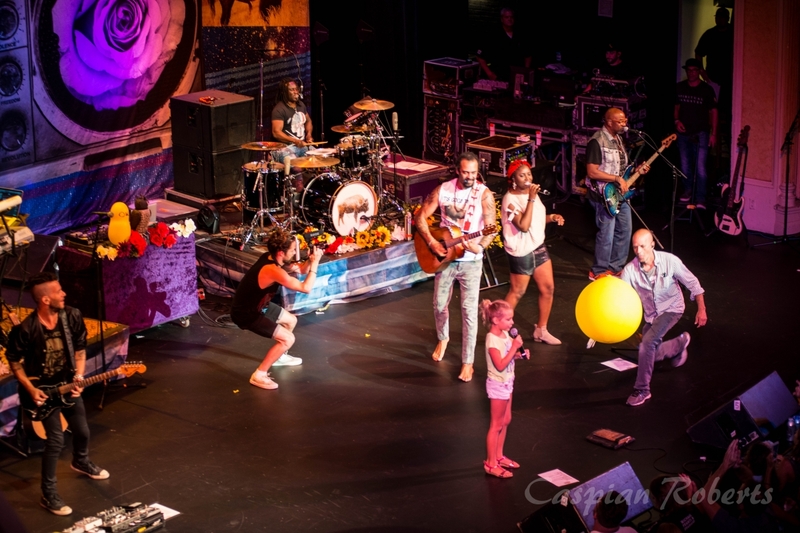 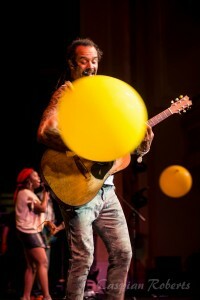 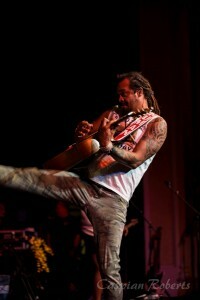 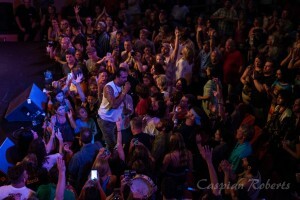 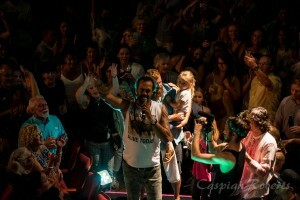 Michael Franti & Spearhead continue to provide a unique must-see concert experience, and we’re so glad our Saenger Theatre brought the love to us here in Mobile!